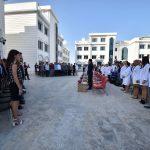 University of Kyrenia Faculty of Medicine and Faculty of Dentistry students’ White Coat Ceremony took place on the 1st of September. 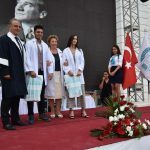 During the ceremony, students who have joined University of Kyrenia family for the 2018-2019 academic year were excited to take the first step for their future profession. 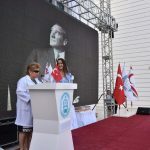 The Governor of Kyrenia Sinan Güneş, Rector Prof. İlkay Salihoğlu MD., Vice Dean and Dean of the Faculty of Medicine Prof. Rüveyde Bundak MD., Vice Rector Prof. Gökmen Dağlı MD., Dean of Faculty of Dentistry and Chief Physician of Dr. Suat Günsel University of Kyrenia Dental Hospital Prof. Serap Çetiner MD. 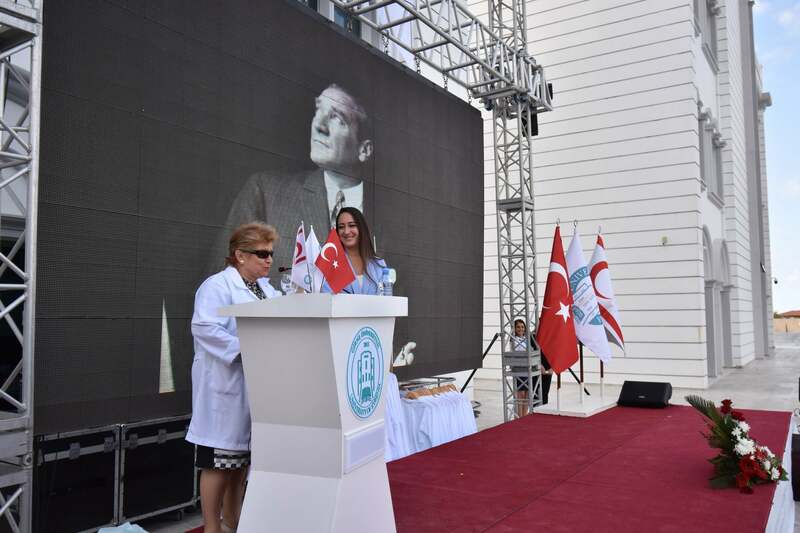 DT., Chief Physician of Dr. Suat Günsel University of Kyrenia Hospital Prof. Nail Bulakbaşı MD., Dean of Near East University Faculty of Medicine Prof. Gamze Mocan MD., academic staff and families attended the ceremony which was held at the University of Kyrenia Campus. 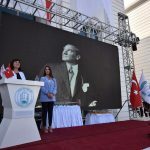 After a minute of silence and the National Anthem, the opening speech of the ceremony was presented by Dean of Faculty of Dentistry Prof. Serap Çetiner MD. DT.,who reminded that their faculty has opened last year and with this motivation they have prepared an interactive, dynamic and high level contemporary education program. Çetiner stated that dentistry is a very special profession which combines art and science. 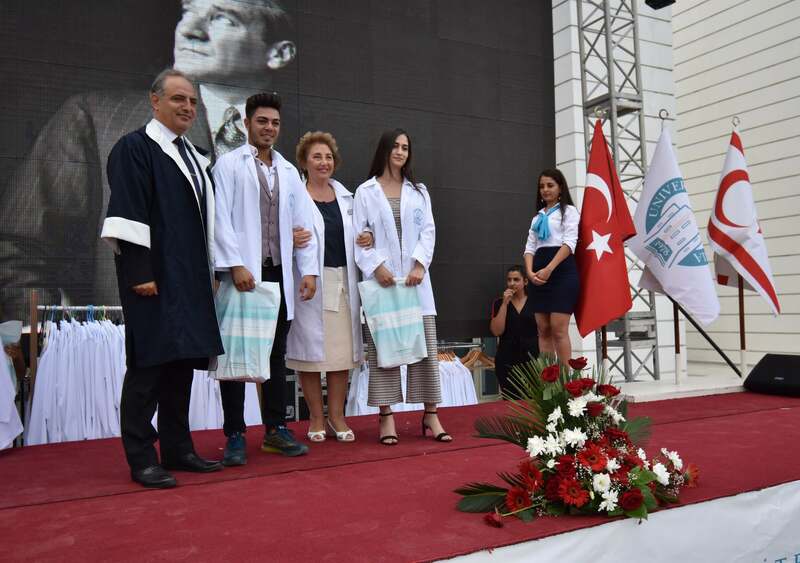 Dean of the Faculty of Medicine Prof. Rüveyde Bundak MD., said that with a dynamic and innovative education approach they aim to be a faculty that adopts advanced medicine practices based on research and science. 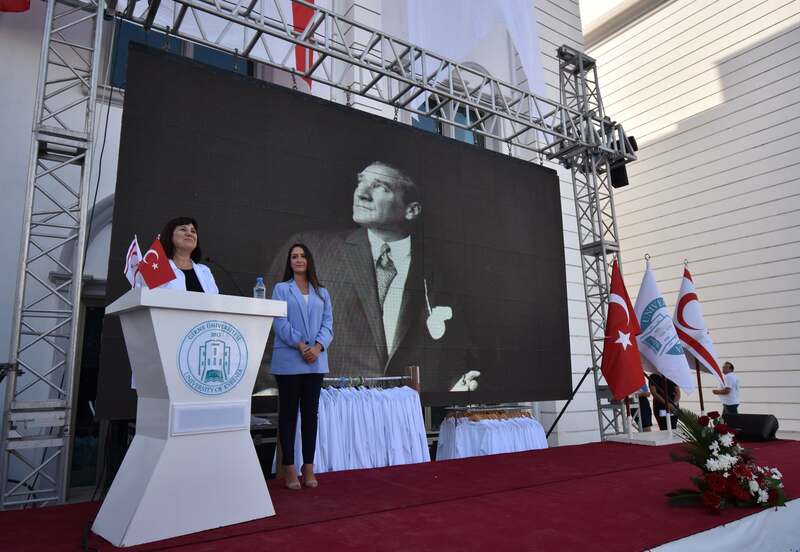 Prof. Rüveyde Bundak MD., underlined that they consider investments such as “Park Palace Residence “which opened to service recently to meet the students’ and academicians’ accommodation needs as a supportive part of this approach. 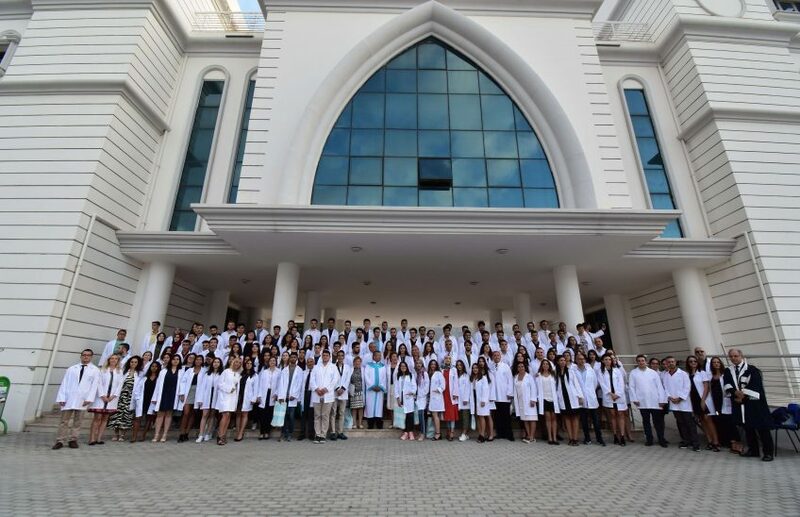 Bundak reminded the Hippocrates quote “Life is so short, the craft so long to learn” and added that the white coat is not only the symbol of doctors but it also symbolizes that they can be trusted. 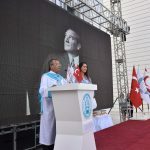 Rector Prof. Dr. İlkay Salihoğlu during his speech expressed his belief that the students will become respectful physicians to honor their nation and country. İlkay Salihoğlu at the end of his speech congratulated Brain and Nerve Surgery Specialist Assoc. 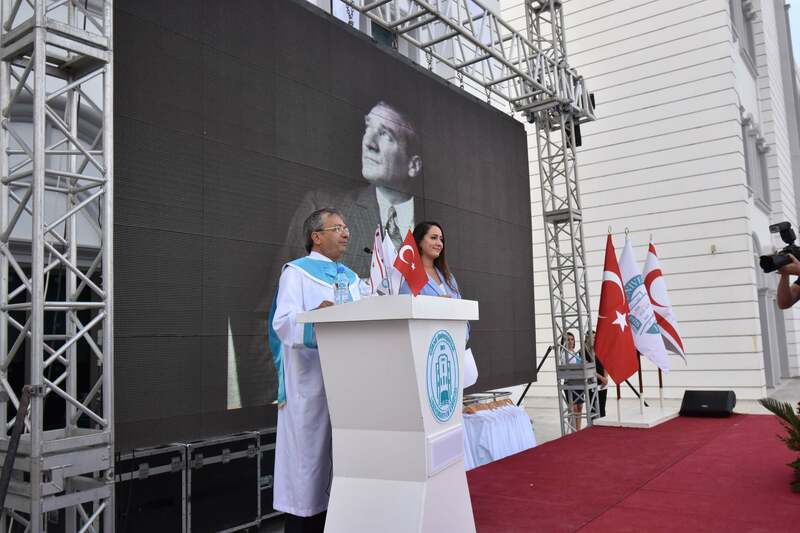 Prof. Halil İbrahim Seçer MD., who became the first recipient of the professor degree while working within the University of Kyrenia and presented him with the Certificate of Honor. The speakers emphasized the contributions of the Günsel family to education. 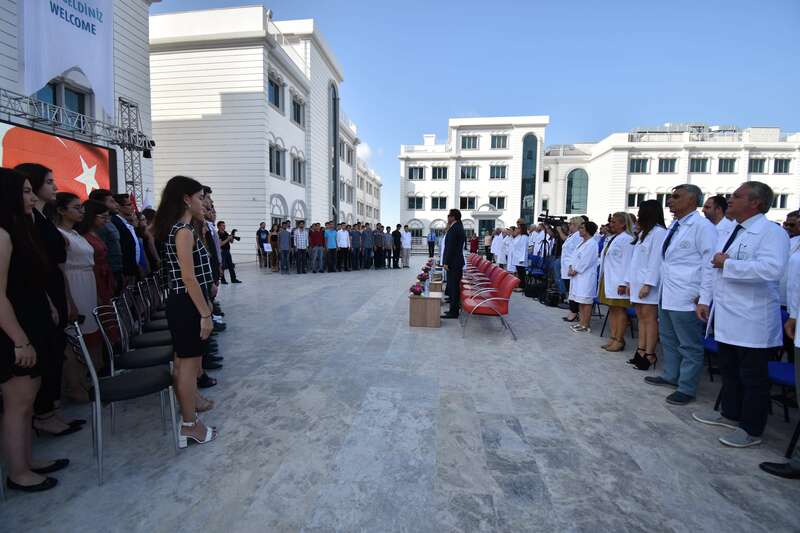 The opening speeches followed by the white coat ceremony, which then continued with the Faculty of Medicine and Faculty of Dentistry students reciting their oath together. The first lesson on “Good Medicine “delivered by Prof. Füzun Yıldız MD. was followed with great interest by both students and guests. The ceremony full of excitement and emotional moments ended with a photo shoot.